Among her purchases, aide bought 22 race horses and a car. 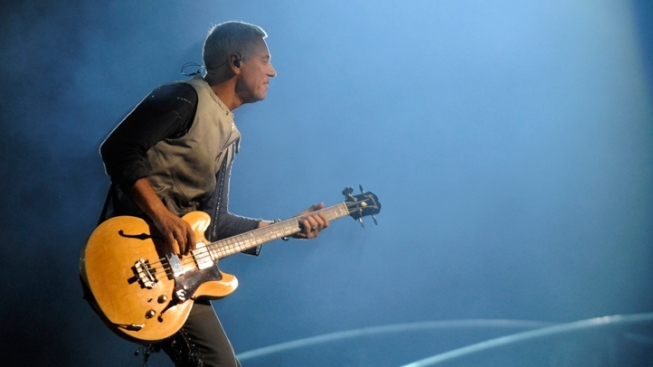 U2's Adam Clayton had nearly $4 million dollars embezzled from him by his former aide. A former household aide to U2 bassist Adam Clayton received a seven-year prison sentence Friday after an Irish jury unanimously found her guilty of embezzling more than €2.8 million ($3.6 million) from the musician. Hawkins had been free on bail after being found guilty last week of 181 counts of writing checks from Clayton's bank account for her own use from 2004 to 2008. Records showed she used the money to buy designer clothing, 22 thoroughbred horses, a car, university education for her two children and first-class flights. "Nothing, frankly, could explain away the scale of this dishonesty other than the greed in pursuit of a lavish lifestyle that was no responsibility of Mr. Clayton's," the judge said. Dismissing her claims that she hadn't understood that what she was doing was wrong, the judge said, "These were crimes rooted in greed and nothing else. Whether she was a fool or clever person really matters very little." McCartan also ordered Hawkins to surrender the profits from a sale of a New York City apartment to Clayton to help reimburse him for his losses. The potential amount wasn't specified in court. Her defense attorney, Ken Fogarty, said she didn't have money hidden away overseas and would do all she could to repay the €2.8 million. Clayton, 52, wasn't present in court to see his longtime domestic assistant sent to prison. But Clayton testified he'd known nothing about Hawkins' four-year spending spree and had given her access to his bank accounts purely so she could pay bills related to his Georgian mansion, Danesmoate, in south Dublin. During the three-week trial, a Dublin travel agent testified that Hawkins booked one flight for her husband to Miami that cost €19,285.08 ($24,420) and another for herself to London and Cincinnati, Ohio, that cost €16,139.66 ($20,438). Clayton testified he was stunned to discover that Hawkins spent €434,000 ($550,000) on acquiring 22 racehorses, saying he had no interest in horses or gambling. Clayton said he first met Hawkins in 1992 when she and her husband were managing a Caribbean island hotel. He said he recruited her to keep the fridge full, pay household bills and look after the place while he was traveling. He paid her a €48,000 ($61,000) annual salary and let Hawkins and her then-husband live in the house rent-free.